From Southern California, a music graduate of UC Santa Cruz. Mariah's music is described as blending "the driving rhythmic syncopations of Latin jazz with the entrancing, asymmetrical meters of East India." With the release of her first CD "Sangria", Mariah touches on the musical sounds of many cultures, drawing special inspiration from Brazil, Cuba, Spain and India. Her first instrument was the piano, but she "fell in love with the sound of the Santur" when she "heard it drifting across the UCSC campus one day", and since has pursued the mastery of it. Mariah has studied and worked with numberous musicians and educators towards crafting here unique musical presence. While at UC Santa Cruz she worked with with ethnomusicologist Fred Lieberman and Mickey Hart on the "Planet Drum" project. She studied with jazz great Art Land and Latin jazz pianist Rebeca Mauléon. In addition to her own group, Mariah can be seen performing with with the world music group Ancient Future. In 2009, Mariah released her debut live concert CD titled 'Sangria." In 2016, she and the Indo Latin Jazz Ensemble recorded Live in Concert, which is scheduled for public release in January 2017. "Marin may be known as a rock ’n’ roll county, but it’s also home to some of the foremost musicians in global fusion — a form of acoustic jazz that requires melodic invention, masterful musicianship and fearless improvisation. Eight of the best players on the planet are featured on pianist Mariah Parker’s new album, “Indo Latin Jazz Live in Concert,” recorded at Yoshi’s in Oakland, Berkeley’s Freight & Salvage, the 142 Throckmorton Theater in Mill Valley and Bob Weir’s TRI Studios in San Rafael." "Parker kicks off her solo career with a well textured world beat date that finds her multi-instrumentalist abilities and her wide open ears leading the way. There's nothing but pros on board here who know what to do and they do it in a lively, spontaneous fashion that really grabs you. First class world beat that really covers the bases. The world fusion music movement has spawned many intriguing new musical hybrids. With Sangria, Mariah Parker explores the exciting sonic terrain that blends the driving rhythmic syncopations of Latin jazz with the entrancing, asymmetrical meters of East India. Add intriguing melodic ideas to the mix and the result is compelling music, at once adventurous yet accessible. This debut recording features her original compositions that draw musical inspiration from Brazil, Cuba, Spain, and India. 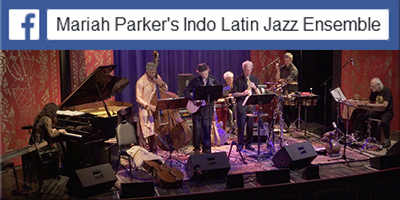 Her Indo Latin Jazz Ensemble accompanies her and includes musicians from the bands Ancient Future, Oregon, Sun Ra, and Herbie Hancock's Headhunters. 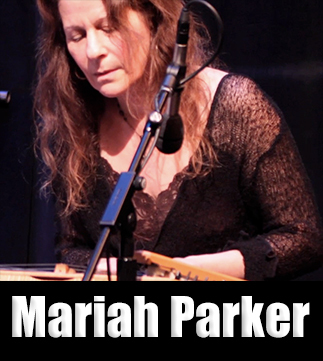 Mariah Parker (composer and multi-instrumentalist), while completing her degree in music at UC Santa Cruz, worked with ethnomusicologist Fred Lieberman and Mickey Hart on the "Planet Drum” project. She has performed in festivals in the US and Europe, and worked with many musicians of note including composer Pauline Oliveros, the late Dumisani Maraire (renowned composer from Zimbabwe) and others. She has studied with jazz great Art Lande and Latin jazz pianist extraordinaire Rebeca Mauleon, and performs regularly with the trend-setting world music group Ancient Future. Contributing to the unique sound of this recording, Mariah's ensemble includes: Matthew Montfort, trailblazing pioneer of scalloped fretboard guitar (an instrument combining qualities of the South Indian vina and the steel string guitar); Paul McCandless, 2-time Grammy Award nominee and woodwind virtuoso; Kash Killion, first-call bass player and multi-instrumentalist with Sun Ra Arkestra, Cecil Taylor and others; Mindia Devi Klein, award-winning bansuri and jazz flutist; Duru Demetrius, latin percussionist with jazz icons such as Joe Henderson and Herbie Hancock; Anuradha Pal, world's premiere female tabla player; Debopriyo Sarkar, tabla virtuoso whose recent tours include Kronos Quartet; Brian Rice, versatile percussionist with players such as Mike Marshall. Milo's Moment - August 2009 The first video from Mariah Parker's CD release concert at Yoshi's, Oakland is now up on YouTube. Playing to a packed house, Parker celebrated her debut release, Sangria, with her Indo Latin Jazz Ensemble featuring Paul McCandless (woodwinds, horns), Matthew Montfort (scalloped fretboard guitar), Kash Killion (bass, cello), Duru Demetrius (Latin percussion), Brian Rice (percussion) and Debopriyo Sarkar (tabla).